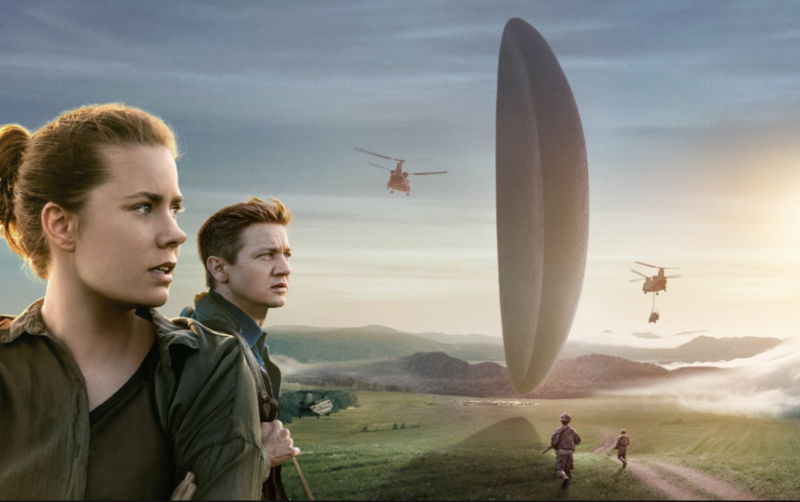 Arrival is unlike any other “aliens come to earth and havoc ensues” film I’ve ever seen. Yes, havoc happens because of the standard aliens-meet-humans fear and paranoia exhibited by the humans. But the movie isn’t about fear and invasion. It’s about evolution and awakening to other inter-dimensional realities. It’s about the beauty and unfathomable intricacy of life. In alignment with its message, Arrival is rather slow and deliberate in pace, spending a lot of time on character development—especially the character of internationally renowned linguist Louise Banks, played by Amy Adams. Called in by the American army to serve as an interpreter when one of twelve alien craft—enormous, enigmatic black shells parked at different locations around the globe—arrives and hovers over a ranch in Montana, Louise is frightened and fascinated by the seeming impossibility of the task at hand: learning how to translate the aliens’ obscure symbolic language and communicate with the alien species. Her side-kick at the hastily-erected Army camp is physicist Ian Donnelly (played by Jeremy Renner). Together they slowly figure out how to communicate with the heptapods (so named because they have seven tree-trunk-like legs and are strange to be sure). At the same time they are in a race against time as the outside world goes crazy with fear and the other 11 nations where the aliens have landed start taking up arms as communications with the aliens and with each other break down. A nuanced and luminous performance by Adams provides ongoing cohesion to the story even as her character’s life and mental processes start to unravel as the aliens and their language invade her mind and even her dreams. Or are they dreams? Part of the wonder and beauty of this film, exquisitely directed by Denis Villeneuve, is how the process of Louise’s personal transformation in revealed through a series of intercut dreams/visions that at first glance are totally logical, until they become not logical at all. In fact, they become wildly puzzling … until the gripping climax where the many pieces come together … and a picture of an entirely different space/time reality reveals itself. A serious Oscar contender for Best Picture, Arrival is a gorgeous, thought-provoking film that should not be missed. I saw this movie and loved it. I love this film with a passion. It seems to be more than just a film, but a very possible future reality, with the story itself being the catalyst for a new, non linear way of communicating. I think it’s the most beautiful and inspirational thing I’ve ever seen.